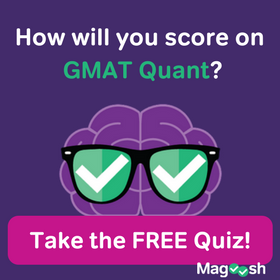 But the GMAT is not easy, and cannot be reduced to estimation and process of elimination. While both can be useful techniques, The Princeton Review predicates its entire pedagogy on what it fondly dubs POE: Process of Elimination. 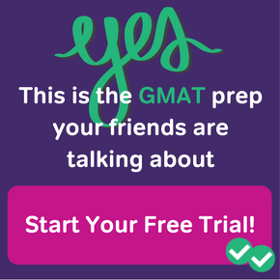 Buyer Beware: The GMAT is far more difficult and requires learning the actual fundamentals and concepts behind the test. I’m going to delve into the specifics of how the Princeton Review GMAT book handles Verbal and Math concepts and strategies. But first, let me preface both the Verbal and Math write-ups with a note: this organizational set up (sub-categories within Verbal and Math) is particularly suited to books that take the time to delve into each section independently. The Princeton Review skims the surface in each section, sometimes wasting an entire page with a single problem or distracting blurb in the margins telling us how the B-school student likes to wake up at 6:45 and watch CNN. 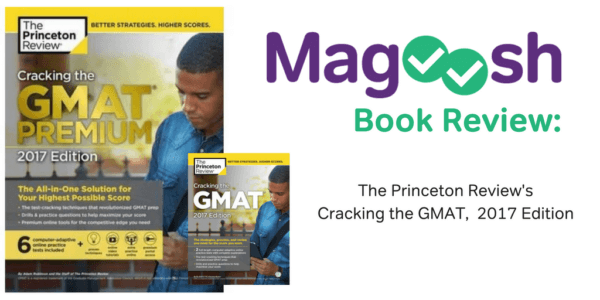 What is clearly missing from every section of the Princeton GMAT books is the ease-of-use and organization found in the Kaplan books (not to say Kaplan is great — it has numerous issues). Nonetheless, I’ve maintained the structure to highlight the different sections of the test and how The Princeton Review handles them. The only section on the Verbal that The Princeton Review does semi-decently is the Critical Reasoning section. The different question types are introduced. One learns how to take apart an argument. And one learns how to spot wrong answer choices. One doesn’t, however, get much practice. We learn the eight question types, but we do not get eight practice questions. It’s funny how little the book delivers compared with how much the cover promises. Doing well on Sentence Correction requires learning both the fundamentals and advanced aspects of English grammar. To achieve this aim, the Manhattan GMAT has a 300-page book. The Princeton Review GMAT book tries to dispense Sentence Correction wisdom in a mere twenty pages (many of which do a poor job maximizing space). To be fair, I could see this section being helpful to an absolute beginner. But even that person would need to learn far more grammar than what is provided here, and would, at the very least, want more practice after learning about a specific grammar concept. (If there is a section on Parallelism it would be nice to have some practice questions). Ultimately, this points to the fact that this book is teaser. For the actual Princeton Review class? Maybe. My guess is they are hoping people purchase their other GMAT guides, those loaded with more questions. Again, The Princeton Review makes everything seem much easier than the test. Passages seem like they were lifted from the encyclopedia. True, that level of reading can be warranted when a book is trying to impart a specific approach. Even then Princeton GMAT techniques are too general: at times I felt like I was reading an SAT guide. With The Princeton Review, unlike Kaplan, I don’t feel that I’ve learned much I can directly apply. Sure, I get the main idea of the passage and know to avoid extreme language in the answer choices… but really there is so much more to the GMAT than that. Terms such as ‘yin-yang’ tend to be more distracting than helpful. That is not to say nothing is helpful here. But for an introduction to the GMAT, Kaplan does a far better job. For an absolute beginner — somebody whose mind goes numb as soon as somebody says the word ‘fraction’ — Princeton GMAT offers an un-intimidating, straightforward approach to basic math. You get math drills, i.e. practice questions to help you learn the basics. Techniques such as “Picking Numbers” are introduced. Unless you are looking to score about 500, the math help in this book will not help you attain a competitive score. Nevertheless, many of us are rusty in math, and in that sense, The Princeton Review provides a better primer than Kaplan (which already presupposes a decent level of math knowledge). The usual suspects: you’ll learn everything from mean, median, and mode to combinations. Again, everything is at a basic level to help reacquaint you in case you haven’t seen many of these concepts in awhile. There is an entire section on Data Sufficiency, and even a section on advanced Data Sufficiency. That said, the latter is not advanced, rather medium-difficulty. Again, same advice: if you are just beginning this will be helpful. That said, Kaplan does a far better job of introducing this tricky section. It essentially provides a framework to build off. The Princeton Review provides practice problems but not much of a framework. Much like the questions throughout the book, the test questions are a dumbed-down version of what you’ll see on the GMAT. That is not to say that these questions are poorly written. In fact, if you have a copy of this book, especially if you are just starting off, doing these practice questions won’t hurt. The explanations are clear enough (though sometimes Princeton Review can be a little vague about why it eliminates certain choices – besides saying use process of elimination). Cracking the GMAT provides a decent introduction. Indeed, if you are only looking to score about a 4, the templates the Princeton GMAT book provides may help you do so. I would have liked to see some example essays. Nonetheless, you can’t really fault any publisher for giving short shrift to the AWA, as most students are concerned only with their score out of 800. Provides a decent math refresher for those who haven’t seen math in a while. Makes the test un-intimidating (a pro for those who are already stressed out enough at the prospect of taking the GMAT). Editor’s Note: This post was originally published in June of 2012 and has been updated for freshness, accuracy, and comprehensiveness. thanks for the review. Helps explain why after three months of study I struggling to improve my GMAT score. 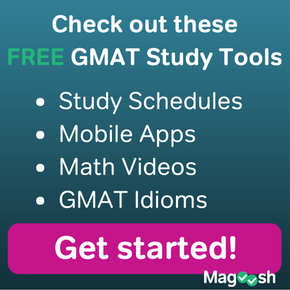 So what do you say a good gmat book is? MGMAT are great for strategies. And for practice questions, the Official Guide is the best source of content. Those reviews are coming soon :). Thanks for the reply. I will buy the MGMAT book. I was planning on buying 3 books- Official guide, MGMAT and I can’t decide on the third one. I can’t decide between Kaplan, Manhattan or Princeton Review. What’s your word on it? Definitely do not go with Princeton Review, unless you are scoring very low. I’d recommend the Kaplan book. It contains everything on the exam. Then, if you need more help on any specific area, you can pick up the relevant MGMAT guide.